Welcome to the our Equestrian Homes Showcase. Here you can find Equestrian Homes & Horse Property For Sale in FL. Search Florida Equestrian Real Estate Listings, Horse Property, Horse Farms, Equestrian Estates, Acrerage & more! View Equestrian Homes & Horse Properties For Sale in Apopka, Eustis, Mount Dora, Sorrento, Lake Mary, Longwood, Sanford and Windermere FL. If you are buying or selling an Equestrian Home or Horse Property we can guide you through the entire process. Our MLS search makes shopping for your new Equestrian Homes For Sale simple. We specialize in Equestrian Homes and Horse Property in Central FL. 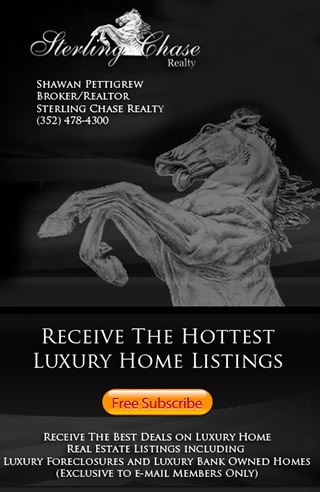 Sterling Chase Realty is a real estate brokerage serving Equestrian Homes and Horse Property in Lake, Orange & Seminole County FL with top-rated agents who can provide expert advice on Equestrian Homes and Horse Properties for sale. Find the best Horse Property For Sale in Florida. Here you can search Horse Properties for Sale, Equestrian Estates, Horse Farms in FL, FL Horse Properties, Equestrian Estates, Equestrian Homes, Hobby Farms, Homes with Barns, Equine Homes & more! to learn more about Horse Property and Equestrian Homes for Sale call us at (352) 478-4300. This Page is updated daily so you are sure to see the latest Horse Property Real Estate information.